Anglers can catch loads of crappie all year long in open water. This just-before-dawn morning is cool, a light mist rises from the water, and the surface of Lake Pickwick is glass smooth. With the early summer songbirds all around us, this day promises to be very pleasant. My buddy, Captain Brad Whitehead, eases his totally equipped-for-crappie fishing War Eagle boat from the quiet boat ramp. We motor into the main body of the lake. Three months ago, the lake’s shoreline was being worked hard by crappie anglers who were catching big crappie and lots of them while the big slabs were on the beds spawning. But that hot bite has long since passed. Today, we’re going after something different—crappie. But we’re going in different places, and we’re fishing in a different way. Before all of the lines are in the water (Captain Brad runs several lines at a time), one of the long, flexible crappie trolling rods bends way over. Brad advises me strongly to take the rod up and bring the fish in. Now, no one will ever accuse crappie of being as strong on the fight as bass, but this fish is not coming in willingly. After a short but vigorous struggle, a wide black-spotted silverside rolls up by the boat. I swing a one-and-a-half-pound crappie into the boat. As it turns out, this fish is just the first of many we’ll catch on this fine morning. There’s no doubt about it; the crappie have not left. They’re still in the lake, and they still bite, but they won’t be on the spawning banks. Anglers need to look in deep open waters and they need to try trolling for crappie. Pickwick and the other big northern lakes in Alabama in June present anglers with a problem. There’s just too much water to cover to find crappie without some help. When I talked to Captain Brad, who specializes in guiding anglers on crappie trips year-round, he had some advice for me. “To find crappie on big lakes after the spawn, you need to get your mind in the same mood as what the crappie are thinking. They are post spawn, and they have one thing on their minds—FOOD! They have spawned, so they are thin and looking to feed up. The one thing anglers need to look for is bait; schools of baitfish. Crappie love to eat shad. Since the shad are always found in massive schools in the big Alabama lakes in June, anglers who know how to find the big schools of bait will almost always find the crappie nearby. Finding the schools of shad is much easier with modern precise electronics. Fish-finders can very often locate the shad schools even in deep water, and this allows anglers to put lures and bait right in front of the feeding crappie. When I asked Captain Brad where he likes to start his June crappie trips on Lake Pickwick, he told me that he really likes the Rosetrail Boat Ramp which is located in the center of Bear Creek. He assured me that any direction an angler decides to go from this launch area will be good in June. When slow-trolling for crappie on the deep flats, Captain Brad keeps a very close eye on his fish-finder. Although hooking and catching stripers can be fun, and pretty frustrating when they tangle up multiple trolling lines as they are brought in, they are good indicators of where the crappie will be. The stripers eat shad, too, and if the stripers are there the crappie will probably be close at hand, too. It all comes down to finding the balls of shad. It’s possible to go on the water in June in just about any kind of boat and gear and luck into some good crappie. 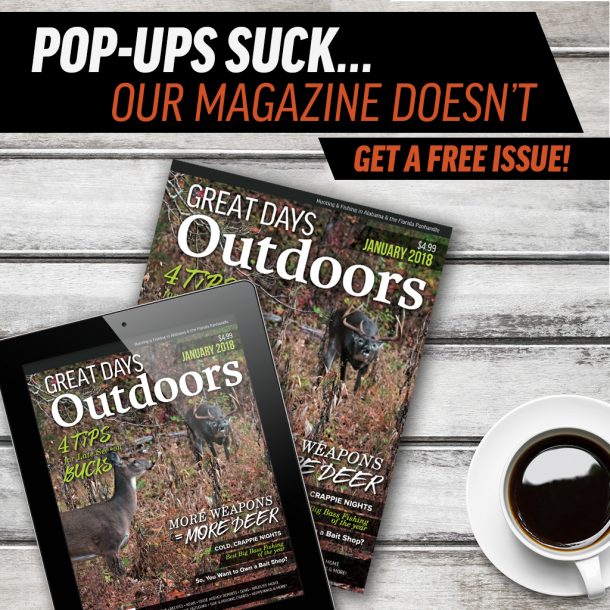 However, specifically rigging a boat and tailoring the gear to crappie trolling will make the process of filling an ice chest with wonderful-tasting slab crappie a lot easier. Selecting a good crankbait for June open water crappie trolling is crucial. 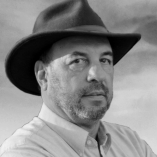 The lure needs to be fairly small—three inches long or less is good. It needs to run fairly deep (at least four feet is acceptable), but deeper is better. More than anything else, the crankbait needs to run straight and true with a tight wobble to the action. It can take a bit of experimentation to find the right crankbait. Or, we can just listen to an expert. A very important point for crappie trollers to understand is that crappie this time of year can be pretty finicky when it comes to colors of lures taken. A wide range of colors—most will need to be bright, fluorescent colors—may be needed when the crappie show very strong preferences from day to day. This tendency to having preferences for certain colors (which changes from day to day) is also another reason for crappie trollers to have multiple rods out at all times. The crappie will generally tell the smart angler what color is the hot color on any particular day. 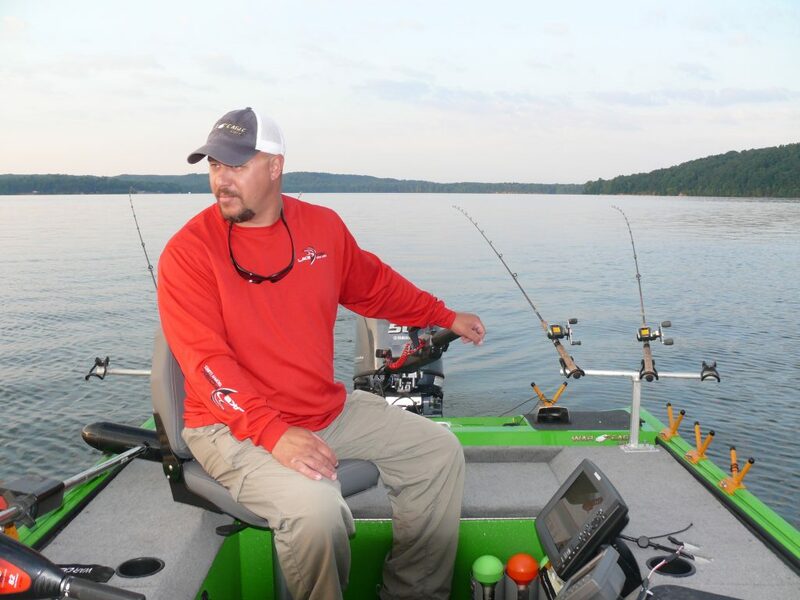 Professional guides like Captain Brad Whitehead make handling their boats in all conditions look easy, but controlling the boat and putting the lures in the proper place is crucial to trolling for open water June crappie. When pulling multiple lines with crankbaits, letting the boat get out of position or crossing the trolling lines can create a big mess quickly. It’s best to keep the trolling pattern simple. Find the deep flat you want to work, start at one end of the flat and slowly pull across the flat while watching the fish-finder and paying attention to the rods. Captain Brad says, “When I catch two or three crappie, I mark the location and circle back around. Usually, I can catch as many as I want when I find them. “Pulling cranks is easy,” Captain Brad says. “You go from Point A to Point B. Try not to turn at all because that causes problems (a tight turn can make a big mess of eight or ten trolling lines and lures out behind a boat). Quite often, when one rod bends over with the strike of a hungry crappie, another rod or two will fire off, too. This is when it gets fun. This is also when it is a good thing to have a buddy or two along on the trip. Captain Brad has some very good advice for folks who want to catch the most and biggest crappie in June. 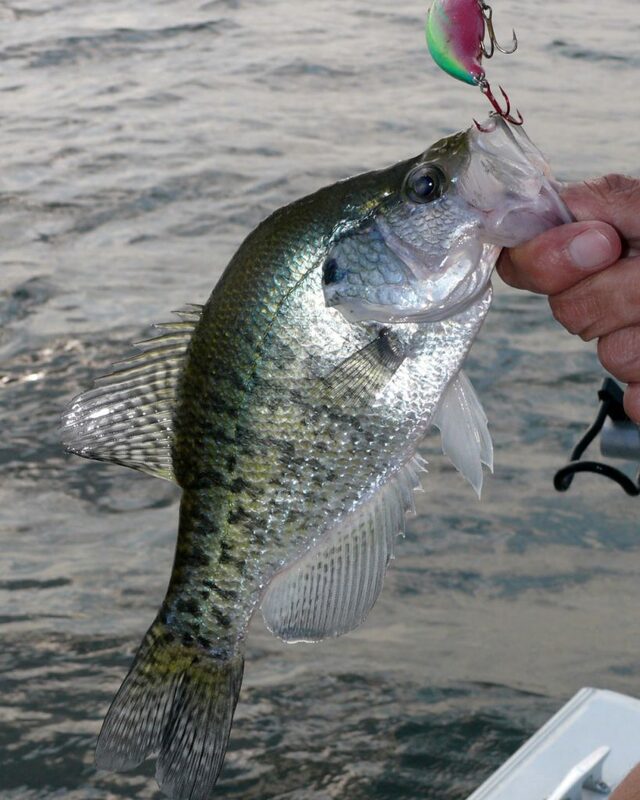 As the sun gets higher, crappie tend to move somewhat deeper and they tend to slow down in their bite. This means that on most days, the bite will be best very early in the morning. Cloudy days can prolong the bite, and sometimes a light rain can fire up the open water crappie bite. Just make sure you have good raingear along on every trip. Also, in the event of very heavy rain and muddy runoff from feeder creeks, the crappie bite is very likely to slow down until the conditions get back to the normal clear-water June conditions. Muddy water tends to shut down the crappie bite in June. Other than these points, there’s little reason why anglers should not be able to go out on Pickwick—or any of Alabama’s wonderful big lakes—and catch a mess of slab crappie for a fish fry. And that’s just about the best possible way to end a great day outdoors.